I promised to give a recap of the craft fair I attended two weekends ago, and unfortunately it was sort of a bust. The fair was outside, and it rained all.day.long. 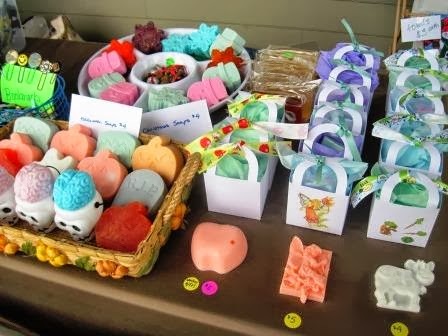 We were under a deck, but my soaps collected the moisture and mist in the air and got gooey. And although the booth fee was fairly high, the people who put it on did not do a good job of advertising. The 40+ vendors there were all rather disappointed that there wasn't much traffic. That said, I learned a lot which was good. And I had good company all day - my mom came with me and sold some of her knitting. My mom brought with her Irene. Irene is her model. 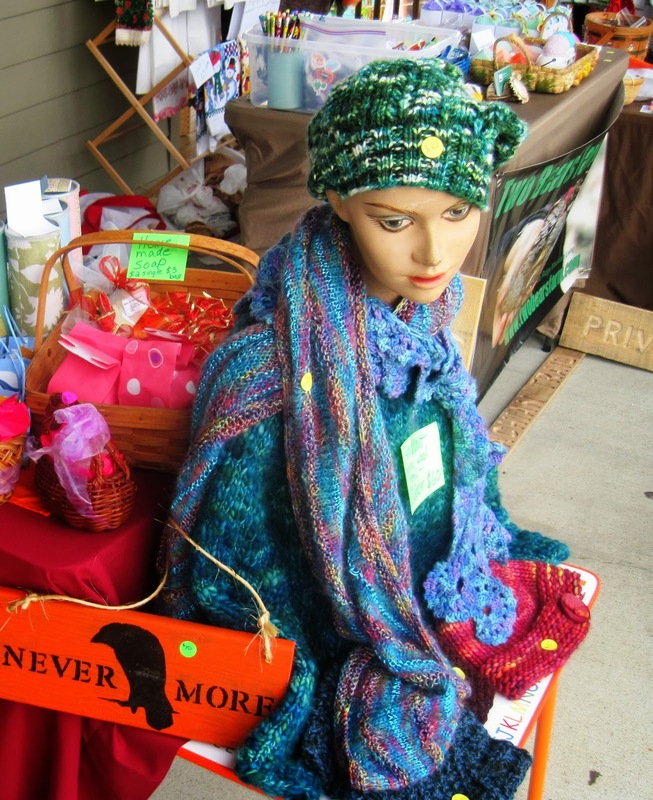 She did a great job, as the sweater and one of the scarves she was wearing both sold. I sold a couple of painted birdhouse gourds, a couple of pencil cases, some soaps, a lot of peanut butter fudge, and some bookmarks. It wasn't a total loss. I am going to give it another try. I've signed up for another one in early November. And this time? It's INDOORS. I love the little bags. The white cow is so cute. My daughter must be love it. Beautiful knitting, cool colors. That sounds like the show that my buddy went to in Roanoke a year or so ago. He said he would not go back as the promoters did little, he checked and couldn't find where it was advertised other than a few signs stuck around. He has success in the shows and I can give you his email if you want as he can point you to the right ones if you want. Also be careful selling in Roanoke as they will come after you for all kinds of fees and tax, they act like vendors are a major corporation or something. It is shame that they didn't advertise more. I am not surprised that you sold the fudge. It is wonderful. I did craft fairs with my cross stitch many years ago. Some fairs were better than others! I wish you lots of luck next time. I know you enjoyed spending time with your mom. I did one that felt like a waste of a day. But then, I got to spend it with a good friend, so it wasn't a waste afterall. ooh, rain and mushy soaps - not good! How disappointing, and a lot of effort, too... but your display looked GREAT! Oh, I'm sorry that it didn't go better. I hope the November one does better. Hopefully being indoors will help. Your display looks really nice. I wish I could go shopping there! And your mother's work is very pretty, too. I think your next one will be more highly attended. As the holidays approach, craft shows are on more people's minds. Your mom's creations are beautiful!!!! And the table with the soap, that is yours I think...everything is so pretty. Too bad about the bad organizing and rain. Bummer. But indoors! That is a smart move. Yay for indoors in the fall! :). I would have gone crazy for your soap! I love the homemade stuff. Weather can really make a difference! Haha, I'm glad the next one is indoors! Too bad they didn't do a better job of advertising for this one. But sounds like you got some sales and learned a lot, so that's a plus. Your table looks good, Lisa! I use those same white bags. :) Glad your next fair is indoors. I have one coming up this weekend and it's OUTSIDE! Fingers crossed that it doesn't rain. Well crud. You can never depend on the weather... so sorry about your soaps. Not fun. Try try again is all I can suggest and hope that the answer lies in having them indoors. 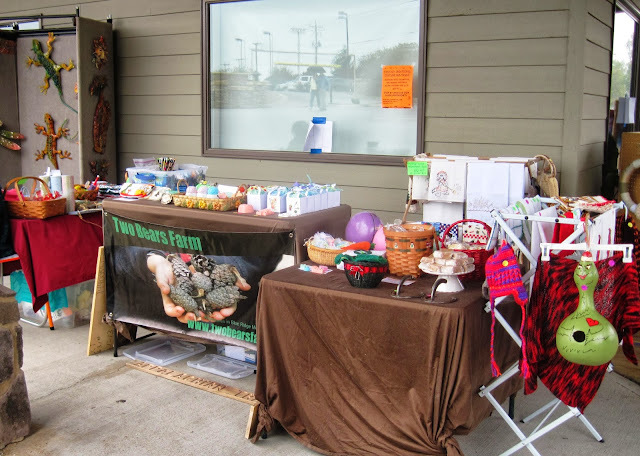 Last weekend our town hosted a harvest festival full of craft vendors. It was a huge success but I can tell you from being on the committee it was a ton of work and lots and lots of preplanning. It was in October and we were advertising starting in August. Sounds like the weather got in the way. :( Maybe you could do some advertising yourself the next time around. So sorry about the rain but your display looks wonderful! Mmm, now I want some good fudge! So sorry to hear it did not get much traffic. Too bad the promoters did not do a good job. Its sad to pay such a high fee and not get promoted. We had rain that weekend too. We went to a festival in Mt. Jackson in spite of it and I bought some bulbs from friends in the garden club. But of course traffic was way down. I am so sorry about that - but don't give up! What a shame! First about the rain and product damage and of course, if they are going to charge a higher cost to rent a booth- they need to be advertising. Craft shows are awesome but if they don't advertise, they let down the vendors who help with the success. My first craft show was outside-and the wind kicked up and kept blowing my display racks over. The people who came were all filthy rich but tight-fisted too. They complained about my prices, but then sucked down glass after glass of expensive wine. (It was a benefit craft fair held at a local winery.) I sold a total of one bag. I'm glad it wasn't a total bust for you. Your display looks great! Irene is so chic! Well, I guess it was a good learning experience. What can you do in the future to save your soaps? The problem is that every fair is different--people will want to buy different things. Glad to hear it wasn't a total bust though.